I have had the wonderful pleasure of being able to work with Rosalee de la Forêt and the release of her new book, Alchemy of Herbs. 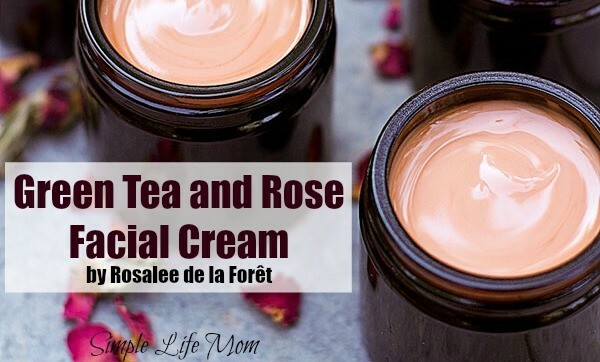 I’m so excited for its release, and I know a number of you are too, so I managed to procure a sneak peek of one her recipes: Green Tea and Rose Facial Cream. This is only one out of many fabulous recipes in her book, Alchemy of Herbs. She really does a great job of using herbs daily for a healthier body inside and out. This recipe is so perfectly up our ally that I was bursting to share it immediately. Not only does this green tea and rose facial cream have all of the ingredients we are used to using in our homemade natural skin care like cocoa butter, bees wax and coconut oil, and fabulous essential oils, it also has a rose hydrosol and green tea infusion. If you’re not used to working with these ingredients, don’t worry. She does a great job of explaining each step. The first four ingredients are used to create the infused oil (jojoba, green tea, rose petals, and alkanet root). The next three are melted together (beeswax, coconut oil, shea butter). The last ingredients (aloe, hydrosol and essential oils) come together with everything else to make your green tea and rose facial cream. So without further ado, here is an excerpt from Rosalee de la Forêt’s new book, Alchemy of Herbs. One of my favorite recipes from herbalist Rosemary Gladstar is her recipe for the “Perfect Cream.” I’ve made my own versions of this blend countless times over the years. I know it’s a big hit because my friends are not shy about requesting another jar! 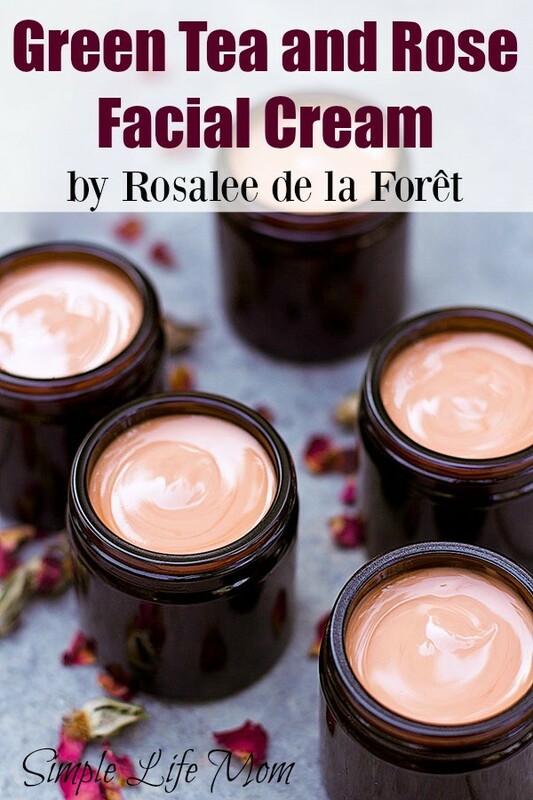 Admittedly, this may be the most complicated recipe in this entire book, but if you love decadent and nourishing facial creams, learning how to make them yourself will open a whole new world of luxury. Most facial creams you can buy at the store—even the “all natural” ones—have all sorts of weird ingredients. This cream is filled with the best and most nourishing ingredients for your skin. Many of the ingredients in this recipe are oddly shaped, so you will need a scale to measure them by weight. Because this cream doesn’t have any harsh preservatives, make sure you use clean utensils, bowls, blenders, etc. Also, make sure all instruments are dry; you don’t want to put any water in the mixture since this can increase the likelihood it will spoil. In many years of making this recipe, I’ve had only one batch ever go bad on me. You can tell a batch has spoiled if you see mold growing on the cream. Jojoba oil is very luxurious. It is shelf stable, and it readily soaks into your skin. It’s also expensive. Almond oil, grapeseed oil, and apricot kernel oil will also work. Rosemary antioxidant can be bought from herbal apothecaries like Mountain Rose Herbs. Besides helping to preserve the oils in the cream, rosemary antioxidant also has protective qualities for the skin. Here’s a tip for an easy cleanup: Wipe down all oily surfaces with a paper towel before using hot, soapy water to wash them. Your first step is to infuse the herbs into the oil. Put 1 to 2 inches of water in the bottom of a double boiler. Place the oil into the top. Add the green tea, rose petals, and alkanet root (if using), and stir well. Turn on the heat and heat the oil until it is fairly warm to the touch, about 100˚F. Remove from the heat. Heat the oil 3 to 5 times per day for 1 to 2 days. You can also put this in a modified slow cooker or yogurt incubator as long as the temperature of the oil doesn’t exceed 110˚F. Once the herbs and oil have infused, strain off the herbs, reserving the oil. When straining the oil I recommend using cheesecloth so you can squeeze all the oil out of the herbs. After you strain the herbs you should have ¾ cup jojoba oil. If you fall short of that, add enough pure jojoba oil to reach that amount. Pour the warm oil mixture into a food processor or blender. Let cool just until solid. Mix together the rose hydrosol, aloe vera, rosemary antioxidant, and essential oils, if using. The next step is to emulsify these waters with the oils. For best results, the two mixtures should be roughly the same temperature. Turn on the food processor or blender with the oils in it, and slowly drizzle in the water mixture. Continue to blend until the ingredients have combined to form a thick cream. Do not overblend. If necessary, use a spatula to scrape down the sides and around the blade as you blend. Spoon the cream into containers. Store in a cool, dark place or the fridge. To use: Massage a tiny amount of cream into your face and neck just after washing your face with warm water. It may feel oily for a few minutes but will soon soak in, leaving your skin feeling silky and smooth. Use within 3 months. Mind begs to know firstly how long is the shelf life since it is an aqueous cream and there is no preservative? Secondly, what is going to act as an emulsifier, since beeswax isn’t as such? Other than that, great ingredients! The beeswax, jojoba, and coconut oils will help the other ingredients to emulsify. It works great using a blender! It will keep for 4-6 weeks, but it’s a small batch and making one once a month is not a huge deal. It’s long enough that it still makes an amazing gift. This seems like a lot to use up in three months if you are only using “a tiny amount”! I think I’d prefer to halve the recipe unless I’m making lots to give as gifts. This does look like a great recipe. I also think I might use another oil rather than jojoba. like emu, which I have “just discovered”. Emu is closely related to our own natural oils…making it great for this…it does solidify at cooler temps like coconut oil, and is a bit spendy, but probably worth it. I find jojoba a bit too heavy for my tastes. Hi SLM! I absolutely love your recipes – I bought some products for Christmas and everyone loved them. Thanks! I was just wondering if I could use beet root powder instead of alkanet powder to make this cream red. Yes, you can substitute beet root powder, as well as kaolin rose clay for a pretty pink color. This is wonderful! Thank you for sharing! I can’t find rosemary antioxidants in my country but I did find rosemary esential oil, would that work?. Is rose hidrosol the same as rosewater? Yes to both. You can use rosemary essential oil and rose water is the same as rose hydrosol. Yes you can. It may slightly change the consistency, but it shouldn’t be by much. Just found your site and I am so enjoying all your different natural recipes to make. I struggle with rosacea and am wondering if this would be a good cream to use for that? Would love to use natural but haven’t found something that really moisturizes well since my skin tends to be very dry and inflamed at times with this condition. Yes, it should help. I know that some lotions and oils just arent enough for my skin sometimes as well. Evening primrose oil seems to be very effective. Lotions seem to be my Achilles’ heel. NO matter what I do, I can’t get a creamy consistency. No matter what, some part of the water will never emulsify, and even if it does, then its flakey and bumpy. I do hold the oils at a steady 150 degrees to make sure flakes don’t re-emerge. Still, without emulsifying wax, I can never get a lotion to “whip” or even form. Most of the fluids just won’t emulsify with these natural recipes. What on earth am I doing wrong? HELP! Why don’t you start with an easier recipe with no melting or emulsifying. Try a whipped shea butter lotion. Mix 1/2 cup shea butter and then slowly add 1/3 cup oil. Blend until fluffy. I have the book (and yours too), both are great. This cream sounds great, do you or will you be selling it on Etsy like your other recipes? Thanks for all the wonderful things I have learned! That’s a nice idea. I’d need to get permission from Rosalee. Your link to 1 teaspoon rosemary antioxidant extract presents a product that just says Rosemary oil. Is there a difference? I don’t have the EOs that you listed here but do have lavender and frankenscence, and i love both. If i were to add these EOs in this recipe, would you recommend it? If so, what would be the proportion you recommend? thank you so much! You can add 30 drops in a combination of your choice of those oils. I have just made the cream and it smells divine. I was hopping for a light pink colour but it came out very dark . I only put a handful of alkanet root, much less then 1 gram. Also I have use only 3 grams of green tea leaves and that was lots ( your recipe says 30 grams) . Is that a mistake or should I have tired to fit the whole 30 grams? Thank you very much for a wonderful cream. I have got 5 good size pots which I am going to share with my friends. It’s no mistake. 30 grams of tea leaves, 1 gram alkanet root (not powder, but root) and 10 grams rose petals should be infused into the oil before beginning. My guess is that you used root powder instead of just the roots? After dping step 1. – 4. How should the consistency feel/ look? Rather watery or thick and creamy. Mine turned out to be rather watery. I had to calculate to ml as we don’t use cup measurement here. I used 236ml jojoba oil befor e it was infused. After the infusion, I had 177ml jojoba oil mixed it up with the same amount of grams as this recipe has of coconut, beeswax an shea butter. If it should be thicker, how do I do that? Or will it get thicker after I blend the aloe vera, rosewater and rosemary in? When you emulsify the oils with the water based ingredients in the end, the mixture will thicken as you blend it.